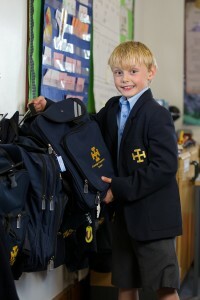 The school bursts into life at around 7.00 a.m., when boarders are woken for showers and breakfast. Once fuelled with a varying assortment of breakfast delights (a full English breakfast being the current favourite), the boarders join the children arriving from home for registration with their Form Tutor at 8.00 a.m. From that moment on, the pace does not ease; academic lessons, games, lunch, morning and afternoon breaks, music practice, rehearsals, supervised prep, and optional activities all have their place within the daily timetable. Form 1 pupils (National Curriculum year 3) finish lessons at 4.30 p.m. Then they have the option to go home or stay an extra half hour for clubs, music and other activities. Pupils in Forms 2 and 3 finish at 4.55 p.m., Form 4 pupils follow five minutes later at 5.00 p.m. and pupils in the Upper School finish at 5.15 p.m. Younger pupils are looked after if they are waiting for older siblings. Those boarding take a break before embarking on their evening programme of prep, supper, activities and relaxation time. Please click here to view the Daily Timetable.